Join us for a day of education and networking at the Connecticut Conference on Tourism on Wednesday, May 8, 2019, at the Connecticut Convention Center! It’s “the” don’t-miss industry event of the year for everyone who’s interested in attracting visitors/guests/attendees. Hotels. Restaurants. Casinos. Tourist attractions. Entertainment venues. Historic sites. Cultural and arts institutions. 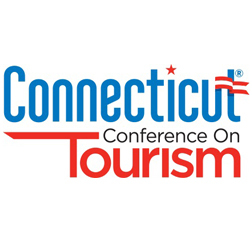 Come share best practices and learn from national tourism and travel experts at this one-of-a-kind conference, brought to you by the DECD/Connecticut Office of Tourism and the Connecticut Convention & Sports Bureau!